This was in response to Classic FM's cute series of pie charts about the brains of various kinds of instrumentalists and musicians. I thought they got the violinist pie chart wrong, as it seems they could only focus on things related to Joshua Bell! Understandable, we love the guy, too. But really, we have other things on our minds! What would YOU put on such a pie chart? 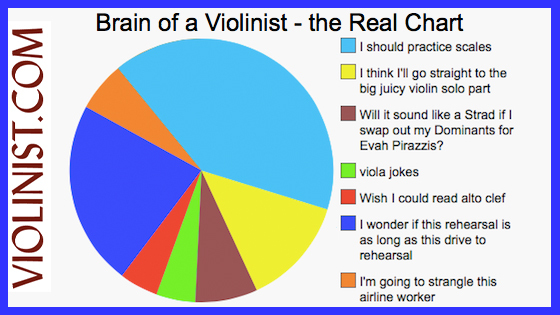 And how about the violist pie chart? March 11, 2016 at 01:40 AM · Half of my chart (in place of practicing scales) would be "I should practice. That practice thing really works." I already use Evah Pirazzi strings and my violin sounds pretty awesome. Otherwise you nailed it. Although I still secretly wish I looked like and played like Nicola Benedetti. March 11, 2016 at 01:43 AM · I find your chart introspective yet simultaneously funny. March 11, 2016 at 07:44 PM · I wonder how many will recall Perlman's story of the time he was asked to play for Heifetz? Perlman asked him what he would like him to play, and Heifetz replied, "Scales"-" Which one"-----and "God" relied, -"All!" March 11, 2016 at 08:52 PM · May I remind everyone that one violinist's brain has been available for research for a number of years, and neither you nor ClassicFM appear to have taken advantage. Consequently both sets of findings must be seriously questioned. March 11, 2016 at 10:39 PM · Einstein may have been a bit of an exception; I'm not sure that all of us fiddle players have genius scientific theories residing in our noodles! March 12, 2016 at 12:58 AM · I am a violist. My chart looks pretty much the same - including viola jokes - except that the "wish I could read alto clef" wedge is replaced by "Help! I've forgotten how to read treble clef!" when I play violin. March 12, 2016 at 02:03 PM · Very cute! March 13, 2016 at 01:04 AM · When I was in school orchestra, being lead violinist was all about trying to make the flute players laugh so they couldn't play their notes! Cruel but fun. 10% One, two three...eight lines above the staff? What's that note? 25% Our principle has no idea what she's doing. 35% Thank god my section leader doesn't loose track of those repeated 8th notes. March 14, 2016 at 10:16 AM · 114.23.225.114, what do you mean? Clarinetists have no sense of humour? Oboists can't play their notes anyway? Or your jokes are so pathetic that only a giggly flute player with a crush on you could even think of laughing at them? March 15, 2016 at 07:42 PM · I think he was thinking along the lines of that George Carlin skit about the class clown, whose favourite time was lunch, when he'd wait until you were drinking your milk and try to make the milk come out your nose. 114.23.225.114 (Can I call you 114? Thanks.) 114, is that what you meant?